SOUTH BEND, Ind. 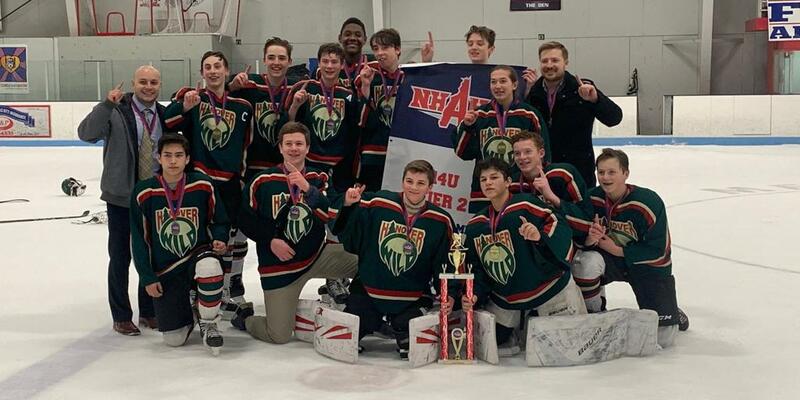 — Somebody was going to go undefeated in the 1A title game at the 2019 Youth Tier II 14U Chipotle-USA Hockey National Championships, and it turned out to be Atlanta Fire Elite topping the KC Mavs, 2-1, on Monday. Both Atlanta and KC went undefeated throughout pool play, and led the 1A division in scoring. The Mavs scored 20 goals over four games, with Atlanta’s 19 goals a close second. Both teams allowed a division-low four goals each. KC Mavs forwards Cooper Carpenter and Carter Eibes led the division with five goals each. Atlanta Fire Elite forward Denver Waddell led the division with nine points in four games. The KC Mavs narrowly defeated the Vegas Jr. Golden Knights on Sunday in order to qualify for the championship game. Vegas took the early lead when forward Austin Moline lobbed a puck in the air through the neutral zone while shorthanded, then beat the Mavs’ defender down the ice to open scoring. The first period saw several other breakaways for Vegas, but Mavs goalie Damien Johnson was up to the challenge, including stopping a penalty shot awarded to Vegas’ Ryan Pavlinsky at the end of the first period. The Mavs settled the game down in the second period, tilting the ice in their favor and scoring twice. An empty net goal from forward William Biggar in the final minute of play sealed the deal for the Mavs. In other notable action, the Portland Jr. Winterhawks took Team Montana to a shootout on the first day of play, a game marked by a strong performance in net by Portland goaltender Oliver McDonald. McDonald made several huge glove saves in overtime, and finished the game with 34 saves overall. He stopped three of Montana’s five shooters to give Portland the win. The OKC Oil Kings led the division in shots taken (141) yet scored the fewest goals (3). Goaltender Jacob Phillips played all three of his team’s games, facing 50, 51, and 40 shots. The Charleston Jr. Stingrays and OKC Oil Kings were the only teams in 1A play to go without a win; the Oil Kings picked up one point in an overtime loss to the Vegas Jr. Golden Knights. Team South Dakota went undefeated during 2A pool play, outscoring opponents 23-8 over five games. All of their wins came in regulation except a 5-4 win over the Charlotte Rush, a game which featured six total power play goals. Charlotte came back from a 4-2 deficit to tie the game early in the third period, but South Dakota forward Trent Anfinson gave his team the win on a power play in overtime. 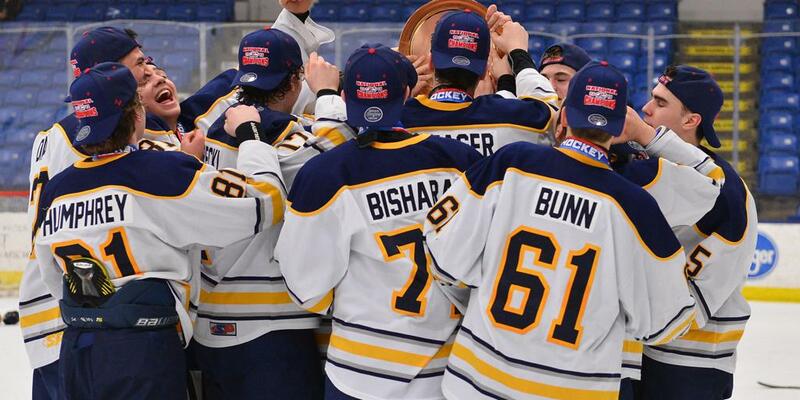 But it was the Carolina Jr. Hurricanes who prevailed 3-0 in the national championship game. The Jr. Hurricanes lost their opening game by a score of 6-2 to Providence Hockey Club, but won the rest of their outings in a series of close games. Team South Dakota led the division in goals scored, finishing pool play with a total of 23. The Hurricanes were tied for fourth with 16, letting their defense and goaltending take the lead in their wins. South Dakota also had the division’s best power play, converting at 42.9%. Three players tied for the scoring lead in the division: Will McDonnel of Team South Dakota, Jason Brown of the Burlington Bobcats (BAHA), and Brock Bergeron of the Maine Gladiators all finished pool play with nine points. Bergeron and South Dakota’s Anfinson each had six goals in five goals played. The Fairbanks Arctic Lions traveled perhaps the most miles to South Bend. Hailing from Fairbanks, Alaska, the Lions brought a sizeable crew of supporters with them. The Lions played in a series of close games, with both wins coming in shootouts. They ultimately fell short of the finals with a 4-1 loss to the Hurricanes on the final day of play. Despite having one of the division’s top scorers, Burlington was the only team in 2A which did not record a win. They were outscored 23-11 over three games of play. While the Chesterfield Falcons sailed to a 7-1 victory over the North Jersey Avalanche in order to secure their spot in the final game with the St. Lawrence Steel, St. Lawrence had a tougher route, playing in a tight match with the Marquette American Legion Junior Wildcats. The Steel won 3-2, but it was Marquette that struck first, with forward Drew Dellies scoring on a breakaway. The action was back and forth, with the teams tied at two apiece until the 8:16 mark of the third period. Marquette goalie Liam Beerman made a huge save moments earlier, only to see his team immediately take a penalty. St. Lawrence forward Rhett Palmer scored on the power play and the team never relinquished their lead. While Marquette tried several times to pull its goalie for an extra attacker, the Wildcats had difficulty keeping the puck in the offensive zone and could not capitalize. It was an emotional finish for Marquette, who went into the final day of play at the top of its pool but could not pull off the win. Texas Tigers forward Jacob MacDonald and St. Lawrence’s Palmer led the division with nine points each. MacDonald, Palmer, and Steel forward Bryan Jones each scored seven goals. Isaac Weatherford of Chesterfield ended pool play with a save percentage of .945 over two games, leading all goalies who completed a full game. And he was lights-out in the championship shootout, stopping all four shots he faced after saving 32 of 34 shots during regulation. Only one goalie in the division recorded a shutout in a full game. James Rorro of the North Jersey Avalanche shut out the NorthStars Hockey Club by a final score of 5-0 in one of the tournament’s bigger upsets. Rorro stopped all 23 shots he faced. The shutout was the NorthStars’ only loss and while they finished play still atop their pool with nine points, they would not get the chance to proceed to the championship game.